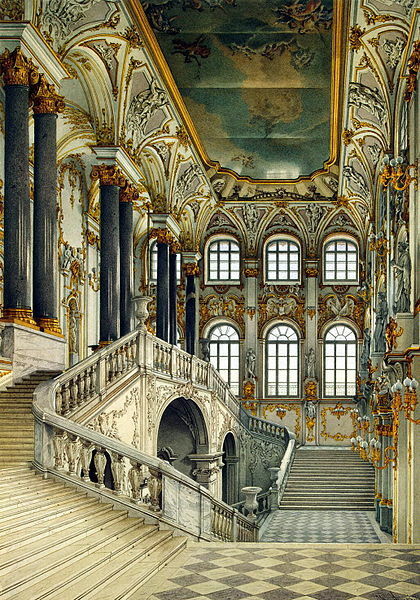 The Jordan Staircase is the main staircase of the Winter Palace, the Tsar’s official, primary winter residence until 1905. It received its name because every year, on the Feast of Epiphany, the Tsar would descend the staircase for the Blessing of the Waters ceremony by the Neva River. At the edge of the frozen water, the St. Petersburg Metropolitan dipped a golden cross into the river thrice, through a frozen hole, in commemoration of Jesus’s baptism in the Jordan River. (Speaking from firsthand experience, the Jordan River is more like a little creek, not nearly as wide and wild as all the songs make it out to be.) The Tsar then received some of the water to cross himself with, and there was a gun salute from the opposite bank of the river. Copyright Jennifer Boyer; originally posted to Flickr as The State (Jordan, or Ambassadors’) Staircase. 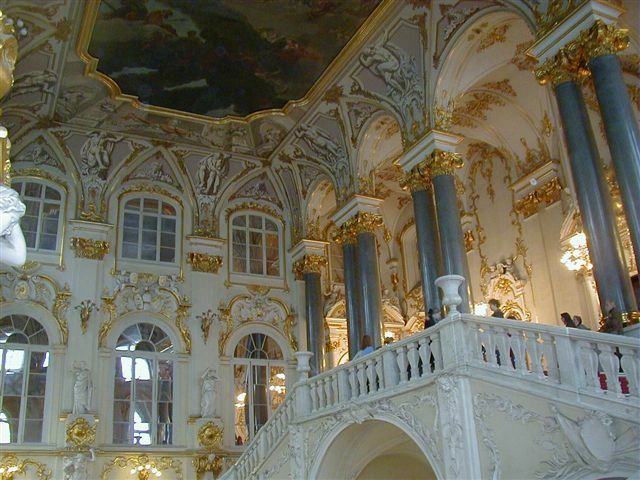 A fire broke out in the Winter Palace in 1837, and when the Jordan Staircase was rebuilt, the gilt bronze handrails were replaced by white marble, and the pink columns were replaced by grey granite. The ceiling of the stair hall depicts the Greek deities at Mount Olympus, and also contains alabaster statues of Wisdom, Justice, Grandeur, Opulence, Fidelity, Equity, Mercury, and Mars. In the middle of the first landing, there’s an 18th century marble sculpture, Allegory of the State. The Jordan Staircase served as the focal point for arriving guests at state functions and receptions. 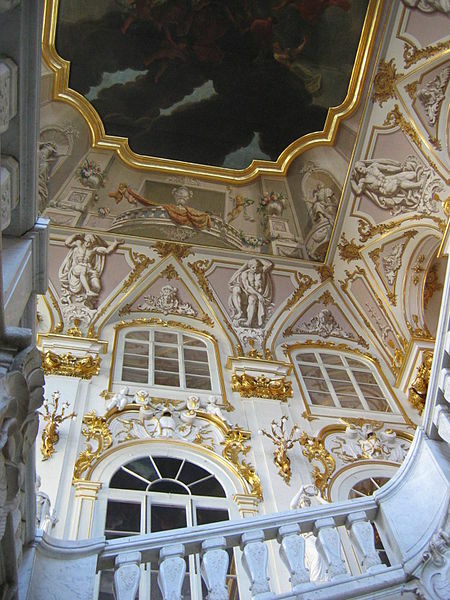 They would enter the Winter Palace through the Ambassadors’ Entrance in the central courtyard, pass through the colonnaded ground floor, and then ascend the staircase to the state apartments. 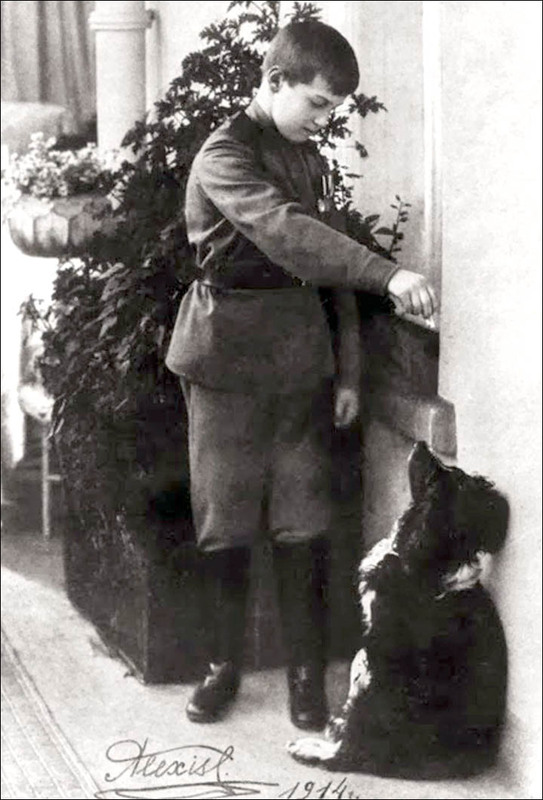 Joy, a male spaniel, was acquired by the Tsesarevich Aleksey in 1914, possibly late 1913. Like many other members of his family, he was crazy about animals, and had many pets, a number of whom he’d rescued as strays. Joy accompanied the family into exile, and was a comfort and loyal companion to his young master even under the worst of circumstances. In my alternative history, Joy provides that same comfort and love after Aleksey is rescued and carried back to his room by one of the liberators. Joy was the only member of the Imperial Family to survive the massacre at Yekaterinburg in real life. The other two dogs were murdered along with their people, but Joy got away. 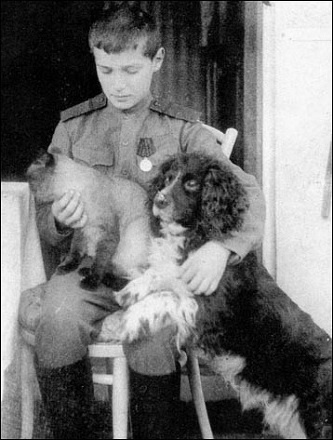 One of the guards, Mikhail Letemin, took pity on him, and when the White Army reached the city eight days later, Joy was rescued by Colonel Pavel Rodzyanko, serving with the British Expeditionary Force in Siberia. Joy was blind by this point in his life, though he seemed to constantly be looking for his young master, and was very depressed his people had gone away. In Omsk, former lady-in-waiting Sophie Buxhoeveden came to see him, and he gave her an ecstatic reception, seeming to recognise her scent and thus expecting his people to soon be coming back. Colonel Rodzyanko took Joy to England, where he lived out his days by Windsor Castle and was buried in Sefton Lawn. He never emotionally recovered from losing his master. Such an interesting historical overview. The staircase is magnificent! Beautiful pictures. What a wonderful dog! The story was very touching…and what a perfect name for such an incredible soul. Super interesting! Pets and history — a delightful combination. A very sweet story. I’m always teary when I read about the faithfulness of a dog. What hearts they have. Thanks for sharing about JOY the spaniel! I cannot handle sad dog stories. I am absolutely incapable of handling sad dog stories. Oh my god. Please say the dog’s okay in the book. Joy survives in the book, just as he did in real life. Dogs are amazing in their attachments! Beautiful architecture! I’m so glad Joy survived the massacre. Dogs mourn as much as humans do. Thanks for visiting The Doglady’s Den.